Space is limited. To RSVP for each program, please sign into Anchor Link and click on the respective links below. Please note that some events require additional ticket purchases. If you are planning on bringing guests or dependents, please indicate how many +1’s you will have in your RSVP. Thank you! *Schedule subject to change based on availability and/or due to inclement weather. Dec. 11 | Opryland Lights | 5:30-9 pm | FREE! 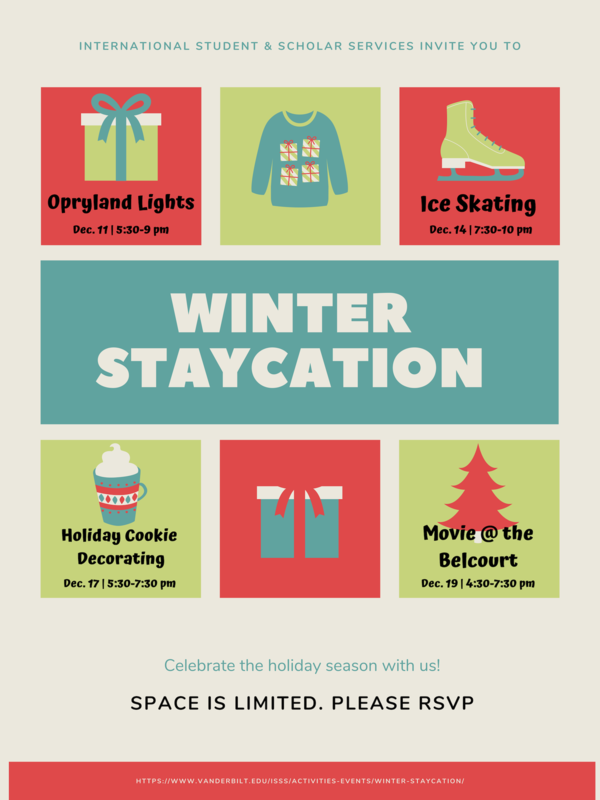 Dec. 14 | Ice Skating and Pizza | 7:00-10 pm| First 40 registered FREE! What’s winter without some ice skating? ISSS will reserve a private area and will offer free admission to the first 40 attendees who RSVP! Tickets purchased at the door will be $7. We will also be serving free pizza and drinks at the rink at 7:15 pm. Skate time is from 7:30-10 pm. Please arrive earlier to check-in and rent your skates. RSVP for this event. We will leave the ISSS lobby to walk over to Centennial Sportsplex together at 6:45 pm OR you may meet us there around 7:00 pm. Dec. 17 | Holiday Cookie Decorating & Hot Cocoa bar | 5:30-7:30 pm | FREE! Bake and decorate holiday cookies with us at the Vanderbilt Rec Center! We’ll have an open kitchen available for you to make your culinary creations. We’ll also have a hot, build-your-own cocoa bar to keep you warm this winter. All international students, scholars, and families are invited. Meet at the Rec Center Teaching Kitchen, to the right of the indoor track. Dec. 19 | Movie @ the Belcourt | FREE Dinner! Limited Free Tickets! Join ISSS for a showing of a classic American film directed by Steven Spielberg, Gremlins! We have a limited number of free movie tickets, so make sure to RSVP for one!